Canine Influenza - Now there are TWO strains going around! We are all familiar with the “flu”. It is important to know that most influenza viruses are species specific. There are certainly known exceptions – for instance, the human influenza virus can be spread to ferrets! The canine influenza virus is a relatively new virus. It probably is a mutation from the Equine virus. This virus was first recognized in January 2004 in association with the racing Greyhound population in Florida. At present it has been recognized in about 30 states. Canine influenza is a highly contagious respiratory disease with symptoms ranging from a soft, moist cough to severe pneumonia. It is important to understand that most dogs that become infected will have the mild form of the disease. The cough may be similar in sound to the typical “Kennel Cough” that we are all familiar with. In addition to the cough, many of the dogs will develop a thick nasal discharge, which is usually caused by invasion of secondary bacteria. If this bacterial invasion spreads to the lungs, then the dog may develop a high fever with full-blown signs of pneumonia. Since this is a “new” disease, almost all dogs will be susceptible. Kennel Cough vaccines and Distemper vaccines will not give your dog any immunity to this virus. It is estimated that nearly all dogs that become exposed to the virus will become infected with most of the dogs showing some signs of disease, usually in the mild form. The incubation period is 2-5 days and the course of the disease is usually 2-4 weeks. Yes, dogs can die from this disease. Estimates from 5-8% mortality are thought to occur. At present, there is no speedy diagnostic test for this disease. The best way to test is to send “paired” blood samples to a diagnostic laboratory. The first sample is to be taken when the patient is first presented with symptoms. The second sample is taken three weeks later and then the two samples need to be sent together to the lab. Because of the need for the three-week sample, this diagnostic test is really not helpful in planning any therapy. It is only really valuable if we want to document the case as being influenza or not. So, treatment is based on the pet’s symptoms. 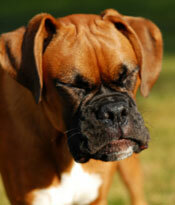 In many cases, you cannot easily distinguish cases of Kennel Cough from Canine Influenza. There are two different vaccines that are needed for "full" protection. They can be given at the same time or separated if you prefer. They are both “killed virus” vaccines, so they cannot cause disease. The vaccines may not completely prevent your dog from getting influenza, but will lessen the severity of the disease if it should occur. To be protected, your pet will need two shots (of each strain), spaced 2-4 weeks apart. Please call our office if you would like to schedule an appointment for this vaccine. St. Charles Animal Hospital, providing pet care services, diagnostic laparoscopy, diagnostic testing, diagnostic ultrasound, digital radiography, flea and tick prevention, professional grooming, cancer surgery and chemotherapy, laser declawing, dental care, heartworm treatment, laparoscopic surgery, laser surgery, video endoscopy, vaccines, dermatology, tibial tuberosity advancement (TTA) surgery, and orthopedic surgery. Proudly serving the entire Charles County, including Waldorf, White Plains, LaPlata, Brandywine, Charlotte Hall, Mechanicsville, Hughsville, Fort Washington, Indianhead, and Accokeek, MD, Maryland. Zip Codes: 20601, 20602,20603, 20604, 20613, 20622, 20695, 20616, 20646, 20637, 20607, 20617, 20677, 20659, 20664, 20693, 20675, 20640, 20744, 20745.